Mutual Fund App – There are multiple ways to invest in Mutual Funds. One such way is Mutual Fund App. However it is difficult to identify Best Mutual Fund App. Recently I have received e-mail query – Which are the Best Mutual Fund App for easy online Investing? Which Mutual Fund App allows you to do SIP on the move? Which Mutual Fund provides you real-time updates, helps you consult experts and allows you plan and invest at the touch of a fingertip? In this post, let’s try to get answers to all these questions. 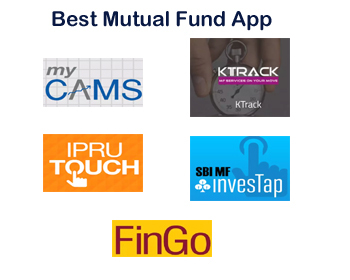 First Best Mutual Fund App is myCAMS Mutual Fund App. Key Features of myCAMS Mutual Fund App are given below. myCAMS allows you to access your investment across multiple mutual funds via single interface. You can do SIP, fresh lumpsum, and NFO Investment via myCAMS app. You can make watch list and monitor your investment easily. You can schedule future transaction using this app on the move. In short, myCAMS is best mutual fund app. You should use this app for mutual fund investment in 2018. However, please note that myCAMS do not support some leading mutual fund AMC like Franklin India, Reliance Mutual Fund etc. You can download this app from Google Play. FundsIndia is second best mutual fund app. FundsIndia mobile app allows you to invest in mutual funds and equities. The key features of FundsIndia Mobile App are given below. You can read latest investment news and recommendations from FundsIndia’s experts. The third best mutual fund app is KTrack by Karvy. Key Features of KTrack Mutual Fund App are given below. You can also avail Nonlogin services like miss call service, Easy SMS service. If you want to invest or track ICICI Mutual Funds on the go you can use IPru Touch Mutual Fund app. The key features of IPru Touch MF App are given below. IPru Touch allows Investor and distributor to invest in ICICI based mutual funds. You can have access to your portfolio statement and transaction history on the move. This app provides various inbuilt calculators. You can access information about various products including videos. You can contact ICICI Prudential executive using this app. You can change your mobile number, email id or password using this app. If you have invested in ICICI Mutual funds or planning to invest in any ICICI mutual funds you can use this app. FinGo is app for investing and tracking Aditya Birla Sunlife Mutual Funds. The key features of FinGo Mutual Fund app are given below. Like all other MF app, this app also provides facility of purchase, redeem and switching of Mutual Funds. You can view a portfolio of Aditya Birla Sunlife Portfolio. This app also provides a facility of calculator and tools. You can get product information and download the factsheet. You can also set alerts using this app. HDFCMF mobile app is for investing and tracking HDFC mutual funds. The key features of HDFC MF app are given below. You can subscribe, redeem, switch schemes of HDFC mutual funds. This app allows you to do e-KYC on the move. You can get folio valuation on the move. You can request Account statement using this app. Which Mutual Fund app did you use on the move?